When Theodosius died in 395 AD, he left the Roman Empire to his two sons, Honorius and Arcadius. Honorius took the West and Arcadius the East. But like other emperors who had been brought up at court, neither of them was very good at ruling, or even very interested. Their wives and advisors did most of the work and held most of the power. Arcadius’ wife Eudoxia held most of his power. 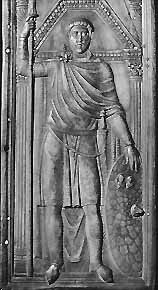 A Vandal named Stilicho (STILL-ee-ko) held most of Honorius’ power. Stilicho had joined the Roman army and risen through the ranks to become an important general. It didn’t take long for the Germans and Goths to realize that the new young emperors were weak and so this was a good time to attack. Roman generals also saw this weakness and revolted. First, Constantine III, a general in England, declared himself emperor at York in 405 AD. He took all the Roman troops out of England, across the English Channel to France, and he marched his army through France, collecting the French troops so they could all march on Rome. But while Constantine III was doing this, nobody was watching the border. In January 409 AD, a lot of Alans, Vandals, and Sueves crossed the Rhine (which was frozen solid) and came into the Roman Empire. There were no troops there to stop them, so they just travelled around France taking whatever they wanted. Both women and men came, and they brought their children, so they seem to have meant to stay. Meanwhile Constantine III was trying to take over Spain. He sent his general Gerontius to Spain, but then Gerontius decided to make himself Emperor instead of working for Constantine III. In order to get a good-sized army together, Gerontius seems to have agreed to let the Alans, Vandals, and Sueves into Spain, and they promised to help him out. So the Roman government sent out a general to stop Constantine III. Constantine III was killed, and so was Gerontius. All of their soldiers (the ones from England and the ones from France, and maybe the ones from Spain too) were taken back to Italy to deal with the Visigoths. This left England, France, and Spain pretty much open for Germans to take over. Back in Italy, the Visigoths were attacking. The Visigoths had been living inside the Roman Empire since the battle of Adrianople in 378 AD. But they had not been treated very well: the Romans had kept them from getting food or building decent houses. 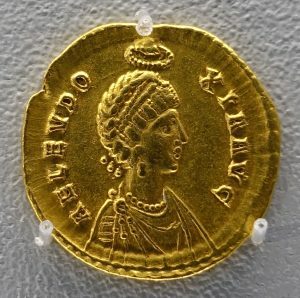 Under their new king, Alaric (AL-arr-ick), the Visigoths demanded gold from Honorius. When he said no, the Visigoths marched on Rome. Despite the gathering of soldiers to fight them, the Visigoths not only got to Rome but in 410 AD they took the city and sacked it (they wrecked things, killed people, and took what they wanted). The Roman people were shocked. How could anyone attack Rome, the Eternal City? Did this mean that the gods were angry? Did it mean the Christian God was angry? The Visigoths did not stay in Rome, but marched down to the tip of Italy, apparently trying to get to Africa. But Alaric died there, and a big storm frightened them. In the end the Visigoths marched up to southern France and settled there. The Burgundians had already taken over eastern France, and the Vandals and Sueves were in Spain (the Alans got wiped out). 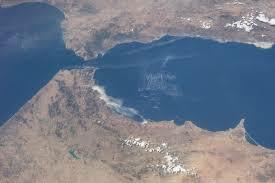 In 429 AD the Vandals sailed across the Straits of Gibraltar and took over Africa, again without much of a battle. This left the Sueves alone in Spain, and the Visigoths gradually began taking over parts of Spain. The Picts and other groups invaded England, and the English wrote to the Romans for help, but the Romans said they were on their own. For years the Roman Emperors had been too weak to do anything about all this, just as further east, in Iraq and Iran, the Sassanian emperors also had almost no power. The invasions of Attila and the Huns in the 440s and 450s made things worse. Finally in 476 AD the last Roman Emperor in the West, Romulus Augustulus, was removed and his place taken by a German named Odoacer. Corruption and the Decline of Rome, by Ramsay MacMullen (1988). A leading historian argues that the collapse was caused by economic conflict between the upper and lower classes of the Empire. I don’t agree, but see for yourself. The Fall of the Roman Empire, by Michael Grant (1976, reprinted 1997) 0684829568. Grant’s an easy, clear writer, but he blames the collapse on too much government bureaucracy and taxation – again, I don’t agree. Fall of the Roman Empire, by Arthur Ferrill (1986). Blames the collapse on military losses – I find this much easier to believe, although Ferrill’s book emphasizes Roman military mistakes rather than the strengths of the invaders. Early Medieval Europe, 300-1000, by Roger Collins (2nd edition 1999). Sees a gradual transition, rather than a collapse, but I like the emphasis he places on attacks from outside the Empire. The World of Late Antiquity AD 150-750, by Peter Brown (1971). Also advocates for a gradual transition, with an intellectually thriving early medieval world. Cite this page: Carr, K.E. The Visigoths sack Rome – the fall of Rome. Quatr.us Study Guides, September 3, 2017. Web. April 21, 2019. This helped me with my history homework. I’m delighted to hear it! Thanks for writing to let us know, and I hope your assignment turns out great.